New cloud-based catalogue Letrs offers free fonts for its subscribers. Typeface collections are a fundamental yet expensive asset for designers. This might have caused some creatives (whisper it) to steal fonts in the past. But thankfully, a new cloud-based font library called Letrs is here to help fight piracy and shake up how designers work with typefaces. Touted as a "Spotify for typographers", Letrs offers an enormous library of fonts for a monthly fee. It means designers will no longer have to buy fonts – instead you'll just use what you need. 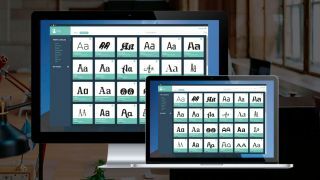 It offers a way to easily manage a library of fonts and there's also the option to collaborate with a team, so you can share groups of typography styles with your co-workers nice and legally. The app (which has been in Beta up until now) is ever-growing and currently offers roughly 2,400 fonts from different foundries for users to play around with, all for a single monthly fee. It will cost users €7.99 per month for the Teamwork plan (around £7/$9.40, so uncannily similar to a Spotify subscription) or €19.99 (around £17.50/$23.60) per month for Unlimited version. "We plan to change the way agencies, design studios, and independent professionals consume digital fonts," Letrs says on its Twitter profile. To use Letrs, simply download the app, install the software and register. From there you'll be able to use any of the fonts from the catalogue, or even to use and manage your own typefaces by dragging and dropping them into the system. Once you've downloaded Letrs you'll be able to access your fonts from any computer. Letrs is also totally compatible with all Mac OS apps. To choose a typeface, simply click on a style and you're away. Watch the Letrs team explain everything that the app has to offer in the video below. The idea of a cloud-based typography library is a great one, and Letrs provides a handy alternative for designers who don't want to sign up to Typekit. Just like Letrs, Adobe's Typekit is an online subscription library of high-quality fonts. As it is, Typekit offers more typefaces but its pricing structure varies depending on how many styles you want to access. Letrs could be an alternative for designers who don't want to go through Creative Cloud, and if the catalogue's collection continues to grow, it could even work out to be more cost-effective.